Lenka was born in Prague, the Czech Republic, where she studied dramatic arts at DAMU/Charles University (MFA). After coming to the US, she studied acting with Uta Hagen and Herbert Berghof and mime with Marcel Marceau. Lenka teaches at SUNY Purchase and Fairfield University and has also taught at the STW School of Performing Arts and in the Youth Drama Program at SUNY Purchase. She has acted in Equity Regional productions, such as Taking Sides and The Seagull; lead roles in other regional and off-Broadway productions, such as The Master Builder, Uncle Vanya, My Sister in this House, Joan of the Stockyards, and Hamletmachine. She has been featured in over forty television roles, twelve European films, and American productions, including, most recently, featured roles in the independent films, "Apples" and "Trophy Kids." See Lenka’s films. 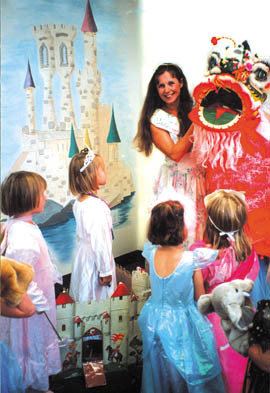 Lenka has written and performed one-person shows on the lives of Hildegard of Bingen, Queen Sofia of Bohemia, and Katherine von Bora Luther, and is also well-known for her hundreds of interactive schools performances throughout Fairfield County and the New York suburban area. Her play for children, The Emperor and the Rabbi’s Golden Secret, is set in the Renaissance Prague of Emperor Rudolf II, and includes alchemy, political intrigue, the legendary Rabbi Löwe, and the monster called Golem. She has extensive credits directing children, adolescents, and adults, and shares her talents in workshops and arts enrichment programs under the sponsorship of the Connecticut Commission for Culture and Tourism. Lenka is the seventh generation of her family to appear onstage since the eighteenth century. Her great-uncle was the noted national actor, Ladislav Pešek. “I was almost born in a movie theatre,” she notes. Read more.